2. The moulded in matrix Composite "Vector" MTA boomerang (1995-96). boomerang to have different profiles. In the models "Gradus" and "Sensor 2"
"Gradus" prototypes was selected for series production on the 26.03.2000.
production is only "Gradus 2" with double reduced LA-profile' camber. - "Sensor 2" with cambered LA/elbow-underside. - "Aussie Stick" Kylie (1992/2000, span 560 mm, mass 350 g, 20 made). towards the optimum, but each thrower can decide himself on the result. 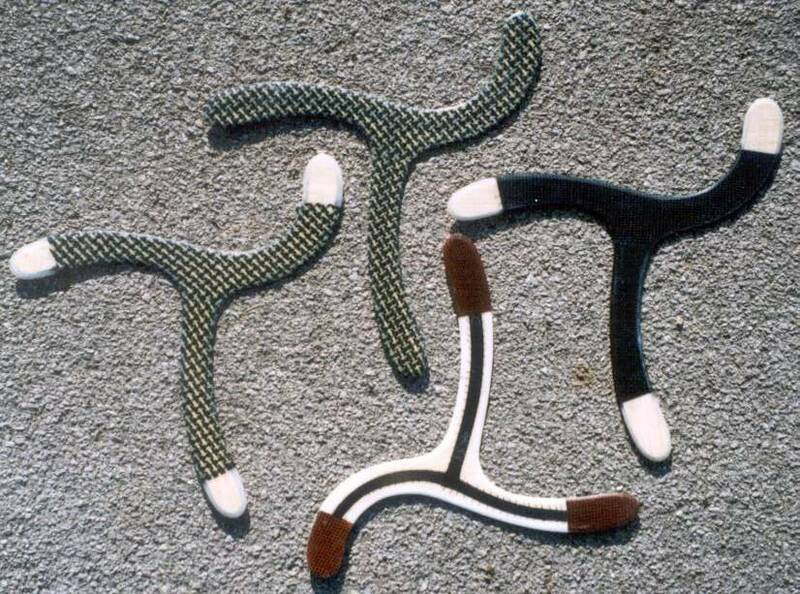 I didn't keep the construction of my Composite boomerangs a secret. 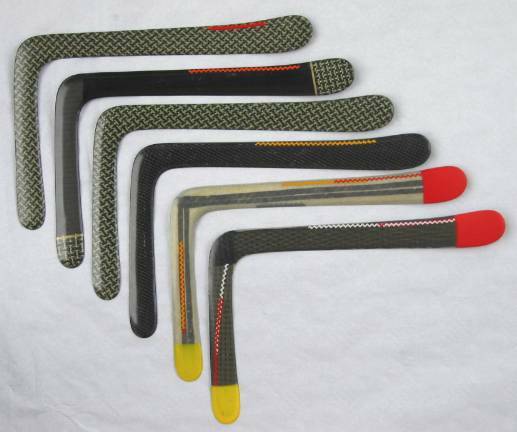 used products (fabric and/or rowing) of glass, carbon and aramid ("Kevlar"
scales with measuring accuracy of 0.1 g, vacuum pump, special oven and more. times of day. During the tests the boomerangs were tuned using 3D/"Zig-Zag"
turbulators (already proposed by me to the boomerang world for 5 years). 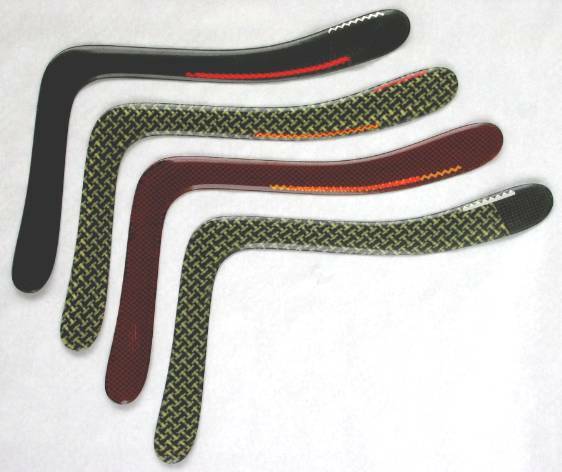 popular boomerang shapes - Hockey Stick, V/Omega and Hook were already "got"
to bend up or to twist the arms. its dimensions and tuning it is most easy to throw and stable in wind. -> Andy Cross (Calgary, Canada) wrote me "I really do like your "Gradus"
mass up to 26-28 g. These are very stable in wind. One 27.5 g heavy "Primer"
After so many words on design and technology, a little about experience. What has been achieved in competition with my Composite MTA boomerangs? MTA event in a tournament in Allentown, Pennsylvania (summer 1997). "Vector" MTA's for big wind, until it flew away." (24.12.2001). Unlimited - 92 sec. (02.08.2002). boomerang in 1991. 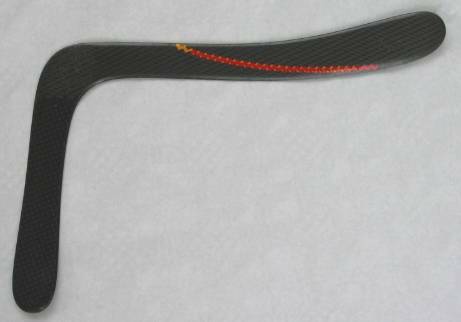 Gary Broadbent (Oh., USA) began first to copy the "Jonas"
making MTA boomerangs in Composite construction. exists. That pleases me personally. A creative competition is very healthy. carbon/epoxy-plate. And the best should win! "Stick" is unique. My Composite Kylie is relatively light - it weighs "only"
arrangement of the plies in the Mulga wood. times I threw with the black carbon "Trigger #3" were 33.19 and 36.68 sec. sec. - thrown by John Gorski on the 31.08.2002 in Delaware, Oh., USA. 1. "Bumerang Welt" (Germany), 2/1996, S.3-5; 3/1996, S.3-5. 2. "DBC Info" (Germany), 51/Feb.1996, S.22; 57/Oct.1997, S.25. 5. "British Boomerang Society Journal", 20/2001, pp.23-24.